Time for a new sink? Do a bit of research on kitchen plumbing, choose the sink you want and then check to see if it requires special tools or pipes. In all cases, use supply lines that are equipped with rubber sealers in the nuts. If this is a new installation, it's best to install the faucets before placing the sink in the counter top. Don't undertake this project if you're a beginner. You need to have plumbing knowledge, expertise and experience in order to plumb a kitchen sink yourself. Remove everything from under the sink. Be certain to place hazardous chemicals out of the reach of children. If you're replacing the water supply lines, turn off the water supply to the house or just the sink. 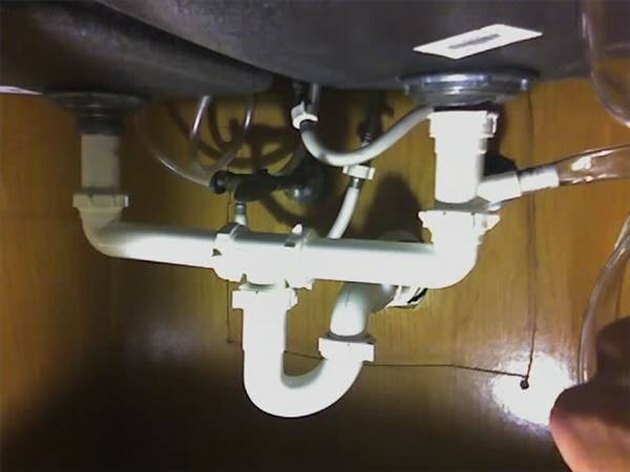 Locate the pipe under the sink bowl without the P-trap. Remove the nut from the end of the pipe that connects this sink drain with the one that has the P-trap. Next, remove the nut directly under the sink hole and pull down on the pipes. If there's a little water in the pipe, clean it up immediately to prevent damage to the cabinet floor. Locate the P-trap and place a bowl under it. Remove the nuts on either end of the P-trap. Depending on the length of the tailpiece coming down from the sink, you may have to pull down on the P-trap to free it from the tailpiece before pulling it away from the pipe leading to the house drain. Let the water spill into the bowl. Remove the pipe that leads to the house drain. This will either go into the wall or straight through the floor. If it has a reducer on the end of it, leave it connected to the house drain pipe. Remove the water supply lines. Clean the threads on the bottom side of the sink bowl(s) where the new pipes will be installed. Check the gaskets around the sink drain for cracks or breaks. Some gaskets are made of cardboard and others are rubber. Replace as needed. Install the new water supply lines. Place the new pipe on the floor in the work area. Identify each of the following: two tailpieces and a tee (if a double bowl sink), one P-trap, one long straight section and one long elbow section. With each part, nuts and washers are supplied. The reference gives more information on pipes for the kitchen sink. Hold one of the tailpieces next to the drain that aligns with the house drain pipe. Cut it shorter if it's too long. Keep in mind that you want to install a Tee here for the other sink. Install the tailpiece with the nut supplied. Next, install the Tee to the end of the tailpiece. Be certain that the Tee connector faces the other sink. Hold the long elbow piece in line with the other drain to see if it needs to be cut in order for it to serve its purpose. Cut it if needed. Do the same with the tailpiece for this sink bowl as well. Install the tailpiece and the long elbow to the Tee from the other sink. Install the P-trap to the end of the Tee and turn it towards the house drainpipe. Hold the piece of pipe that will join the P-trap to the house drain to see if it needs to be cut. Cut it if needed and install it as you did the rest of the kitchen sink drain pipe. Check all the nuts to be certain they are tight. Place the bowl under the P-trap and check for leaks.